This past weekend, almost a thousand people who regularly choose to spend a great deal of time alone gathered in a huge conference room in Los Angeles and created COMMUNITY. We writers and illustrators are too much in our heads. We desperately need to gather in groups sometimes to cheer and console, prop up a shaky buddy or talk a friend down off the ledge. If you are trying to pursue a creative life, I strongly recommend that you make connections with other people in your field … not just online, but in person. I won’t try to recap the whole weekend, but I will share some highlights and finish with a Top Ten list. lindsey_leavitt urged me to run around the halls in my underwear, soniag forced me to accompany her in obsessive pursuit of Sherman Alexie, and lisa_schroeder arrived in the nick of time to catch me before I fainted from euphoria. I met so many terrific people, but it was a conference and not an intimate gathering … so I didn’t get to talk in depth with as many people as I would have liked. For example, I crossed paths with varianjohnson several times, but I didn’t get to discuss his upcoming book with him, or ask what else he’s working on. I hear that Shelli Johannes is hilarious, but I only got to spend a few minutes with her. I met fellow agent sisters lindajsingleton and jo_no_anne, but we didn’t have time to do more than snap photos and say hi. I met Jessica Lee Anderson just before I had to leave – I’m looking forward to reading her book, Border Crossing. I arrived Thursday afternoon and went up to my room to shower off the stench of travel: diesel fuel, recycled air, and cabdriver cigarettes. Then I went down to the lobby to await my beloved high school friend Steve. He and I were joining a couple of other friends for dinner, and I just had time to meet some SCBWI-ers before I was whisked away to spend the next three hours laughing over tacos and margaritas. My friends are funny people. When I told Steve near the end of the evening, “You know, I always feel like the least funny one in this group,” he quickly assured me, “You are.” I pointed out that some people think my book is funny. He looked dubious. 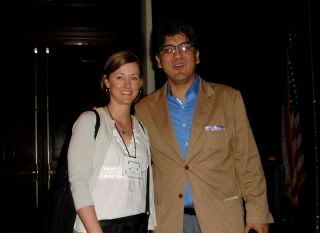 Sherman Alexie gave the keynote speech Friday morning, and everything I’ve heard about him being a mesmerizing speaker – funny, heartbreaking, and inspiring – was confirmed as I swooned into his passionate words of wisdom. In fact, all the keynote speeches I was able to attend – those given by Karen Cushman, Dan Yaccarino, Richard Peck, Holly Black, and Ingrid Law – were brilliant and empowering. I always wonder how one makes the transition from introvert to crowd-captivating speaker. I had dinner Friday night with lots of Debs, including my long-time critique partner, whom I finally met for the first time – sealy38! I failed to take a photo of the two of us together. Gahh! Also in attendance were cindy_pon, cynthea, dreamerwrites, jgurtler, kderting, malinda_lo, millencake, and sydney_salter. Dancing chicken whisperer tamarak and local peep lisa_schroeder joined us, as did Sydney’s cute husband. The manager of Toscanova had wisely put us in a separate room, where we became increasingly boisterous as the night wore on. Once freed from their garrets, writers need to be LOUD. 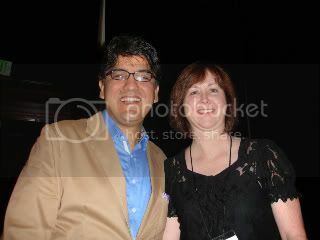 Saturday, soniag and I attended a workshop about the author-editor “process” given by Sherman Alexie and his editor Jennifer Hunt. After his previous day’s speech, I expected every chair in the huge room to be filled, but there were only about 50 of us. 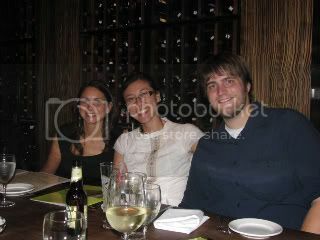 Jennifer encouraged us to move closer to the front; we gathered around to listen to their funny, affectionate banter. During the wooing process of publishers trying to acquire his YA novel, Sherman said that Little, Brown was the first meeting he and his agent attended, and he pretty much decided then and there that he wanted to go with them. It was important to him that Jennifer was black. “And remain so,” Jennifer put in dryly. Publishing is extremely pale, and he was happy that the “brown guy” author got the “brown chick” editor. After the panel, Sonia dragged me and I approached Sherman to ask if we could take photos with him. You will notice in Sonia’s picture, Sherman looks rather frightened. Wow, this is long, isn’t it? Let’s cut to the Top Ten list! 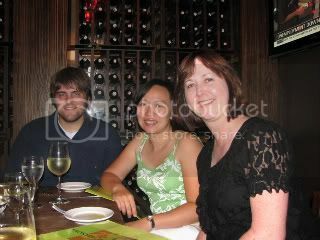 Oh, and I also got to have dinner Sunday night with one of my dearest friends from college - we ate on the patio at Toscanova (it was a great place) - and caught up on the years since we've last seen each other. She looks as gorgeous as the day I met her 20-cough years ago. By the way, I've taken out a new mortgage to pay for the meals consumed during the weekend. I visited Japan about 14 years ago, when the exchange rate of dollar-to-yen was at its worst in 40 years. I vividly remember paying $18 for an iced tea. Food and drink in Beverly Hills is not far off that. 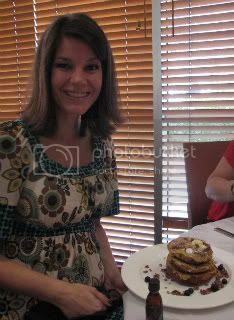 The baby in Lindsey’s belly wants carbs, and you had better not get in the way of her Tower of Sticky Buns with Side of Maple Syrup. Make phone calls fully dressed. Because if you’re just lounging around partially dressed, and you call someone in the morning, and they say, “What room are you in?” and you say, “941,” and they say, “Shut up! Open your door and walk out into the hall,” then you’ll be forced to explain, “I don’t have any pants on.” But lindsey_leavitt ignored the no-pants revelation and insisted, “Just open the door! Peek out.” Then you’ll have to jump into a pair of shorts before you can open the door and discover that she is right across the hall in 942. Once you turn up the music, quiet writers will BUST OUT. 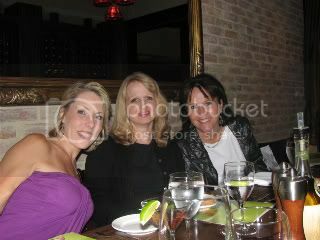 See that white sleeve behind Lisa’s head? 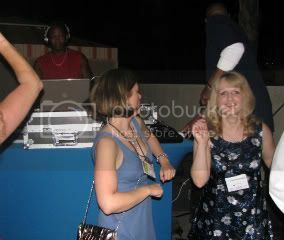 That’s the DJ running away from Sonia's and Lisa's adoration. 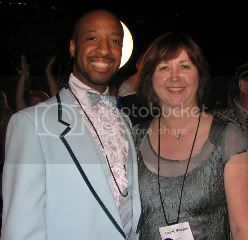 Varian Johnson looking dapper in his blue tux. He dropped by to chat with a few of us at the party, but we were talking about penises (as YA writers do), and he left abruptly. *shaking head* You can’t take us anywhere. I learned at Alice Pope’s online promotion seminar that I’m not supposed to hang back like a wallflower and expect people to hear good news about my book from … somewhere else? I gasped, “Oh my God!” and my face split in two from the smile that burst over it. I almost turned to the lady next to me and screamed, “I got a starred review in Booklist!” But I’m working on self-restraint, so I didn’t. I called my husband and told him, then explained how that was a really good thing. Thank goodness Lisa Schroeder showed up at the gate a few minutes later (we were on the same flight home), and I leapt up and yelled, “LISA! I got a starred review in Booklist!! !” She squealed and hugged me because she knew what that meant, and it was way more gratifying than telling the lady next to me. 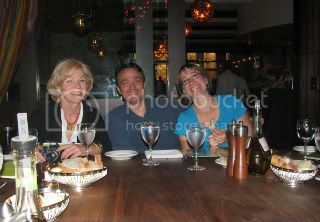 I confess I went to the SCBWI national conference mainly to meet writer friends I’ve known only online. Once I was there, however, I was sucked into the whirlwind of excitement generated by nearly a thousand creative people all packed into one room. And I remembered that I am a writer first … an author second. It’s important to sell my books, of course. I want to make my publisher happy they took a chance on this author. But it’s more important that I continue to write what I love … what I want to read; this writer wants to keep learning and getting better. You are going to LOVE it Janet! I am being very, very patient and waiting to read the book in all its glory when it is released. I read an early version and I seriously think I may call in sick on October 19th so I can stay home and read that day. Fun to read about--sounds like you had a fabulous time! It was nice meeting you in person. Congrats on your starred review! Love this post! I merely listed people I met, but you told stories. And I had no idea you got a picture of me and Lisa at the stage! Haha! And I'll never stop saying how HAPPY I am about your starred review! Thanks for the nice recap, and congrats on the Booklist STAR! Nice recap! Thanks for sharing it. hahahaha - that white sleeve?? Best top ten list EVAH!! Aw, that was wonderful to read (and see)! I wish I was there so I could gush about your book (definitely funny mixed with the poignancy)...someday, we will meet, and our double chins can grow together, hehe. It's funny. I used to go to the conference for the education aspect, and now I go just to be eneveloped in writerly love. Wonderful to meet you! You're so sweet!